Thank you for subscribing to the Quick Base release notes. Our February release is packed with new features and enhancements that deliver on our core themes of trust, simplicity, and power. To query audit logs using a filter, select Audit Logs on the left-hand navigation bar of the Admin Console. Additionally, filters will now apply to the dataset when you select the download option. Simply select the filters you want to apply, then select Download. Audit logs are included with Platform and above plans with 6 months of data retention. Available as an add-on for Premier plans. Our new type-ahead search picker is now available for all apps, both existing and new. You’ll see more information about each parent record with the visual enhancements we’ve made, and even be able to choose what fields appear in the drop-down. The new search feature will make it easy to find the right parent record by searching for it from a child record form. The search will match text found in any of the fields you have included in the drop-down. As part of developing this improved search picker, we also improved the way forms work with reference and proxy fields. In the rare instances where you have both a reference and proxy field on the same form, we will automatically match the value selected in either field so that they are consistent. Tip: As a best practice, forms should include either a reference field or a proxy field, but not both. Our new option for summary reports and summary fields, distinct counts, provides a count of all the unique values in a field. For example, you could use a summary report or field to show how many different products were ordered in a given month. Or how many products were ordered in a certain pricing tier. The distinct counts option for summary reports is available for Text, Text – Multiple choice, and Formula – Text fields. The new distinct counts summary field supports all field types except the following: File Attachment, Predecessor, iCalendar, vCard, Report Link, List User, and Multi-select Text. Need extra calculations in your reports and don’t want to add an extra field? Looking to do some analysis on your data, but don’t have access to add a formula field? 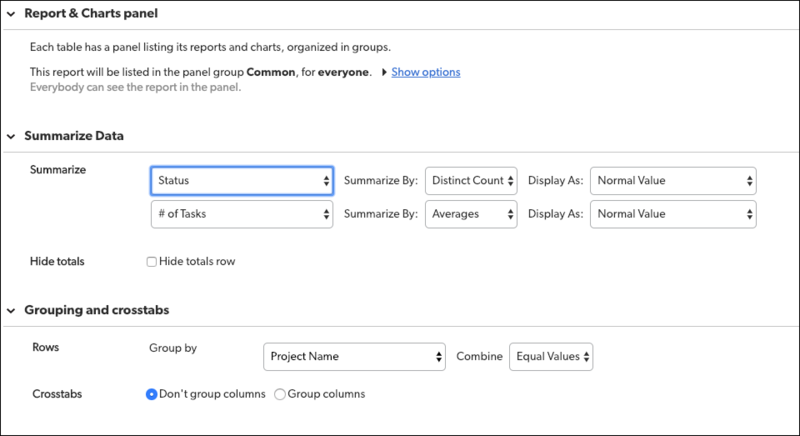 Now you can add up to 3 report formulas to any report. 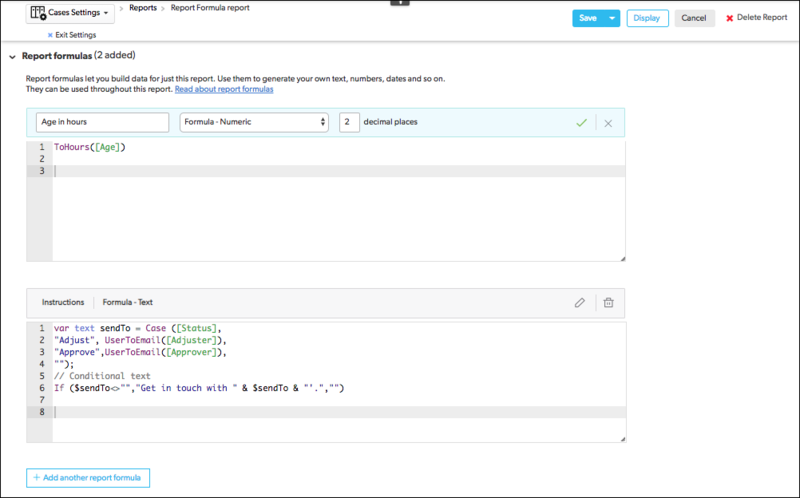 We’ve also significantly enhanced the user interface for report formulas (previously known as calculated columns). Now you can use old field values in Quick Base Automations. With this feature, you can copy the old value from a field in the changed record into your action. For example, if you are tracking products and you change the prices, your automation can use the previous value for a price as part of an action. Introducing this capability also means there are more business cases where you can use a more robust Quick Base Automation instead of a Quick Base Action. Automations now support reading and writing from and to address fields. So that you can individually map and configure an address field with your automations, address fields are split within the automation into subfields, such as street 1, street 2, city, or state. When these fields display on Quick Base forms and reports, they will still display as a single address field. You can now reorder actions in your automations by dragging and dropping them in a new position. This works for actions that don’t have references to previous actions. You can now have images display as thumbnails on your forms. Images uploaded into file attachment fields will automatically display as thumbnails. Select the thumbnail to display the image in full size. For all new file attachment fields, images will display by default; you can disable this feature in field properties. For existing file attachment fields, images will display as thumbnails only if the field properties are set to display as an images. To simplify the builder experience, we’re introducing a new way to access app and table settings through a button. If you’re on the app home page, selecting this button will take you to the App Settings page. If you’re on a table home page, it will take you to the Table Settings page. The new button is the first step of rolling out a new navigation option for settings. Now the icons on your My Apps page expand when you hover over them, displaying the email address of the app manager, the full name of the app, and a menu where you can access hide, delete, and share directly. Better control the movement of your data by hiding the save-as-a-spreadsheet link on table reports. You can hide this option based on your user’s role on the User Interface tab of roles and permissions. The Contains formula now works with textlist (Multi-select Text) and list user. Formula variables and field references now support textlist. The introductory How-to Videos are now available from the My Apps page by selecting How-to Videos. They will initially display as open for everyone who has permission to create new apps on the account. You can collapse this view and it will stay collapsed. Multi-select Text fields are now available when you customize the search widget on home pages. We’re introducing a whole new way to build apps. With the new Quick Base Visual Builder, you can create tables, add fields, and create relationships, all by dragging and dropping. 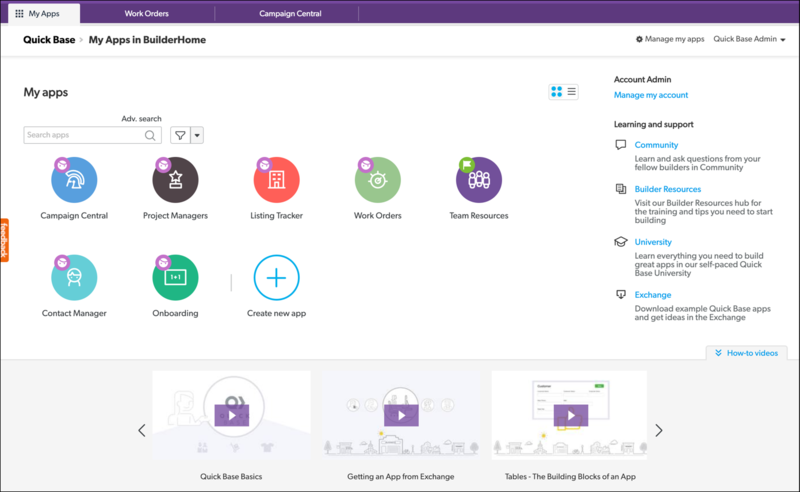 Early access participants can try this new visual app builder by selecting Create New App from the My Apps page, then select Try building your new app with the Quick Base Visual Builder. Then, drag and drop to create your new app. You can also use Visual Builder to edit existing apps by selecting App Management. 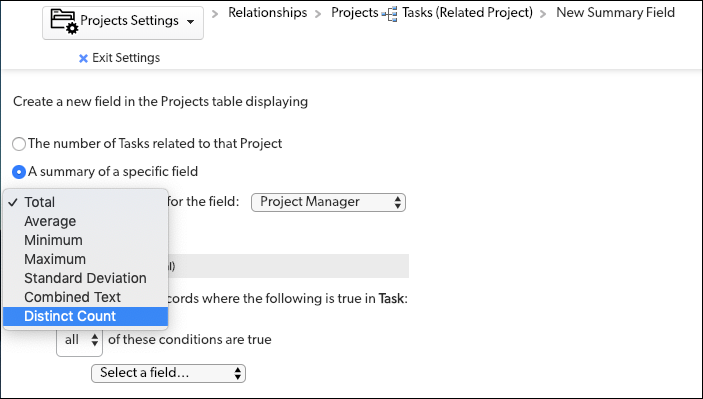 Note: Visual Builder does not currently support the following: Connected tables, lookup fields, summary fields, cross-app relationships, and formula editing. Estimated size of each field. Due to variations in how Quick Base and data are used, we provide an estimated size for each field to give you a sense of relative field usage. About Quick Base memory calculations. To participate in early access for this feature, please open a support case. Do you want to validate Quick Base data based on custom business rules? You can use our formula language to set custom conditions and custom error text output per table. Custom data validation ensures consistent validation across workflows. It’s currently available for imports and grid edit, as well as adding or editing single records using a form or API. We plan to add moving cards on a Kanban report, and dragging-and-dropping to adjust the duration of events on a calendar report. We have some exciting early access programs coming up. If you are interested in participating, sign up to provide us with your information. If you are a good fit for any of the programs, we will reach out to you directly. Early access continues for admins to set different session lengths for users who log into the Quick Base mobile app than for users who log in on their desktop or through a mobile browser. In the Sign-In Policies section of the Policies page of the Admin console, admins can specify the number of minutes before a mobile app user must manually enter their password to log in again. Available for Platform and above plans. In March 2018, we debuted the Admin Console, which lets realm and account admins manage all their administrative functions in one place. Since then, we’ve added many features to this console. Beginning in March 2019, we will remove the Use original experience link, so the new Admin Console will be the experience for all admins. We continue to focus on quality. Below are the issues we fixed this month. Note: Platform security, billing changes, back-end tooling, and performance are all ongoing commitments. Each release may include changes in these areas. When configuring a role, the column headers Save Common Reports and Edit Field Properties now display correctly. We fixed an issue with chart and report color-coding changing when filters are added. When using “Copy value from another record” for a Date/Time field in a Copy records action in automations, field values now copy correctly. The new type-ahead search picker now respects overridden report column headers. QBE013206 We fixed an issue with Gmail connected table refresh in Quick Base Sync. QBE013263 We fixed an issue with an unnecessary error message when previewing the new type-ahead search picker from the Settings page. QBE013266 You can now use the record ID produced by a previous action for a Copy Records action in automations. QBE013270 We restored an error message that displays when you change a Text field to a Multi-select Text and one of the records has a field value that is more than 60 characters long. Long field input values in automations now expand vertically instead of horizontally for better readability. When using “Copy value from another record” for a Duration field in a Copy records action, field values now copy correctly. We increased the default channel timeout for Quick Base Sync SFTP connections. The February release of Quick Base, including the features and fixes listed above, is available starting Sunday, February 24, 2019.